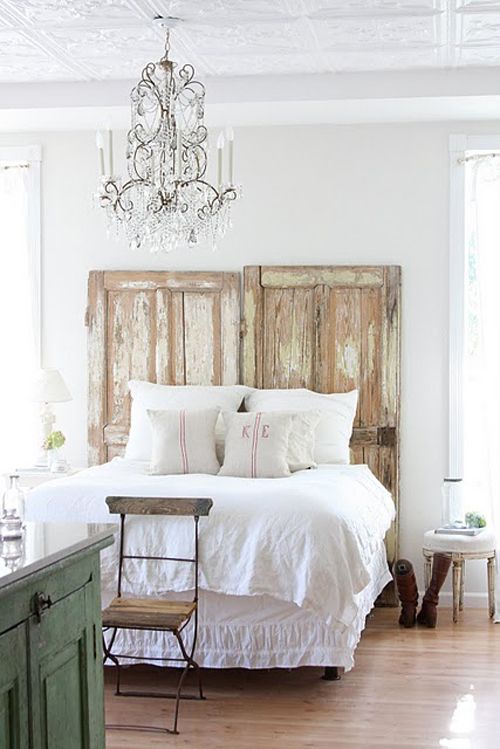 In this beautiful bedroom rustic old doors are used as a headboard for the bed. Love the look, but have to say, I can’t go past a nice, soft, upholstered bedhead that keeps you warm in winter and that you can lean back on to read a book… oh well, as they say, ‘no beauty without pain’! What a great idea, I think I would paint one pink and one blue – his & hers headboards! 🙂 Thanks for sharing. wonderful idea! not for small bedrooms!! simply gorgeous… I’m very into large headboards these days – they’re the focal point of the room, so the bigger, the better!! Love Jay’s idea of painting one pink, one blue!! I saw this in a house I showed this past weekend. It looks amazing and so creative. Great idea. What a creative idea! I’m going to start my search for the perfect doors immediately! Whilst I like the rustic charm of certain designs I think this is a step too far, but maybe my imagination is too limited with interior decor! Insanely adorable and Fabulous !! !